Volatility is mean reverting if the underlying security doesn't drop to zero. If the security has some underlying "value" then its price is co-integrated with that "value". The volatility is the uncertainty of that price as it tracks the security's "value". I may have missed something, but the question was "Why is volatility mean-reverting?". I realize that the standard answer is that the VIX (I'm assuming he's asking about the VIX) is related to the historical volatility of the S&P. A simple version of that relationship provides a reasonable R^2 (see Fig. 1). It relates the VIX to the S&P "wiggliness" (30-day standard deviation of the daily log differences of the S&P), but it doesn't explain why more or less "wiggliness" takes place. To explain that, I have to look at the underlying fundamentals. Figure 2 below, shows the S&P Price (in gray) and what I think is the underlying S&P VALUE (in red). Both lines refer to the left hand scale. This VALUE is calculated from my estimate of sustainable earnings and the appropriate P/E ratio. It is what I think an Investor would set for the "value" (money generating value) of the S&P. 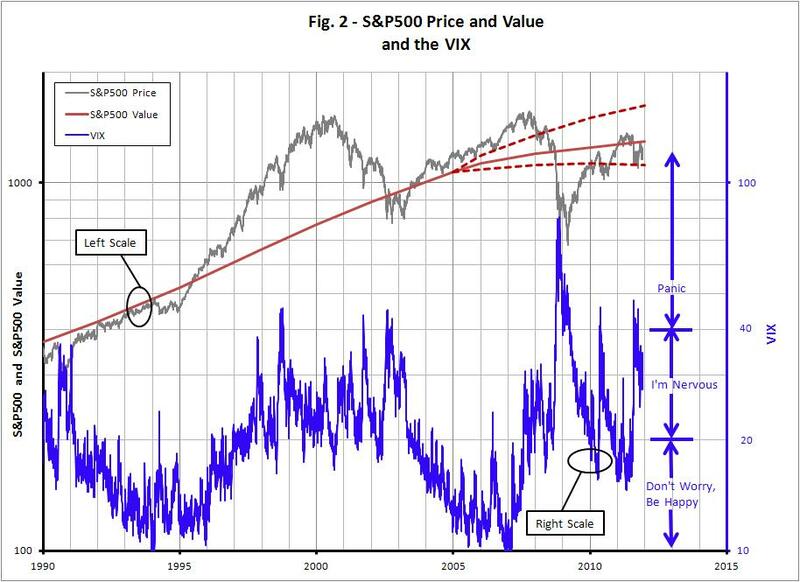 The blue line is the VIX, and is read on the right hand scale. On the right hand side of the graph, I have divided the VIX range into three regions. From past experience, a VIX of 20 or less seems to be a time of "Don't Worry, Be Happy". Personally, that's when I worry the most, but the market seems to be in a care-free state, so I tagged it as such. Next, for a VIX from about 20 to 40, the market seems to be in an "I'm Nervous" state (not care-free, but also not panicky). For a VIX above 40, a "Panic" state seems to show up. Our current VIX of 28 puts us in the "I'm Nervous" state. Now to the issue of WHY. Don't the Happy/Nervous/Panicky states of the VIX have to be consistent with the level of the S&P Price (not just its "wiggliness")? If I'm "Happy" then I'm happy with the level of the Price. If I'm "Nervous" aren't I nervous about the level of the Price? If I'm "Panicky" then isn't the level of the Price nose-diving? As an Investor, the only way I can be "Happy" with the level of the Price is for the Price to be somewhere near or below my estimate of the VALUE of the S&P. That happened from 1991 to 1997, 2003 to 2007, and part of 2010 and 2011. As an Investor, I will be "Nervous" with the level of the Price when the Price is too high compared to the VALUE or when some external "thing" is going on (for example, the Euro-mess). That happened in 1990, 1997 to 2003, part of 2007, 2008, 2009, 2010, and 2011. And, as stated above, when "Panic" takes place, the market sells everything and the Price level nose-dives (1998 LTCM/Russian thing, 9/11/2001, July and Sept 2002, Sept 2008, the Debt-mess in 2010 and 2011). So, if all of the above fits the hypothesis, then "Why is volatility mean-reverting?" can be answered as.....the market has, and probably will continue to spend most of its time in the "Don't Worry, Be Happy" state or the "I'm Nervous" state (i.e. reverting to a state that is not extreme). I agree that my three-sentence answer at the top of this post left out a lot of details, but it is the short version of the same answer. With a little Googling, you'll find more. In my answer above, I purposely didn't get into my technique for setting the "value" of the S&P. It always starts an argument about which is best, Modified Gordon Models, Modified Miller-Modigliani Models, Modified XXXX Models, or whatever. The bottom line is, no matter what valuation technique you use, you'll always find some form of "equity risk premium" that is related to volatility. It's just common sense......there has to be a "price" for being "Nervous" or "Happy". Another issue that usually comes up has to do with using Historical Volatility versus Implied Volatility. All I can say is, the volatility part of the equity risk premium existed long before options were traded. Volatility is mean reverting because you can prove by contradiction that it cannot be otherwise. You have an intuitive understanding of why, but you need something closer to a proof. For an arbitrarily large t (far enough into the future), the probability that the final volatility is in the same order of magnitude as where it started approaches 0. This means if you look at it evolve for long enough, you are certain it will eventually become arbitrarily large or arbitrarily small, which would be nonsense. Therefore volatility cannot NOT be mean reverting. It is mean reverting due to the addition of new information into the market. Imagine a very very simple case: the world only has two traders trading chicken feet. Trader A and B both think it's worth around \$10-\$11 per foot because historically, they have been trading that range all else constant. So vol is low. Suddenly, GSK announces chicken feet cause cancer, trader A thinks they're worthless and trader B thinks some people dont care so he thinks they're worth \$5. It'll trade in the \$0 - \$5 range (higher vol). As the truth slowly unfolds, their opinions will converge (lower vol). Becareful though, this doesn't mean you can capitalize on shorting vol when vol is above the mean (vice versa), realized vol may kill you. And market usually reflects mean reversion if you look at the term structure during crisis, front few months gets bid way more than the back months so you'll have a very descending term structure. This is a hard question because you have to explain i) why does volatility mean revert, AND the opposite effect ii) why does volatility exhibit clustering/persistence? GARCH models can describe this behavior but they do not explain. Many market microstructure models – especially those with learning or evolution– converge over large time intervals to an equilibrium where prices and other aggregate quantities cease to fluctuate randomly. By contrast, in the present model, prices fluctuate endlessly and the volatility exhibits mean-reverting behavior. 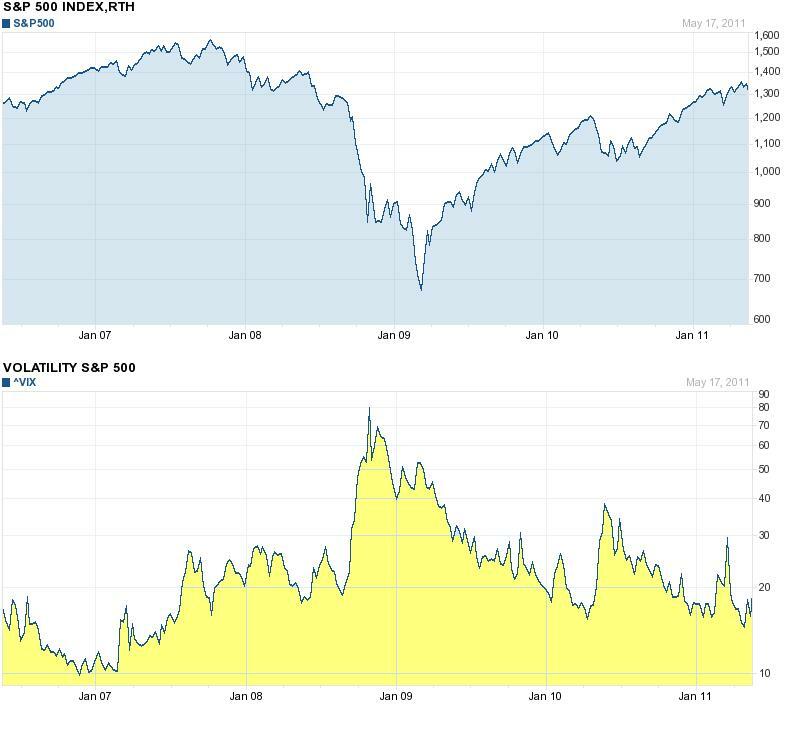 Suppose we are in a period of “low volatility”; the amplitude |rt| of returns is small. Agents who update their thresholds will therefore update them to small values, become more sensitive to news arrivals, thus generating higher excess demand and thus increasing the amplitude of returns. Conversely, in a period of high volatility, agents will update their threshold values to high values and become less reactive to the incoming signal: this increase in investor inertia will thus decrease the amplitude of returns. 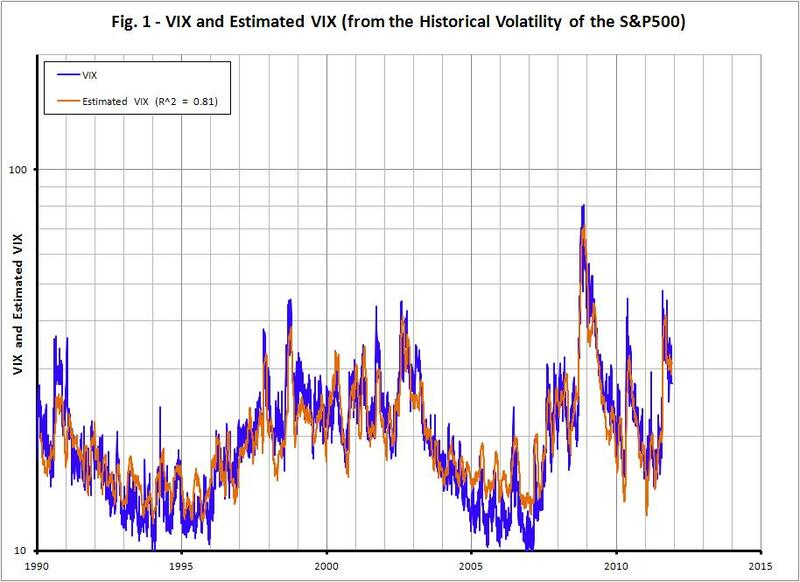 The mean reversion time in the volatility corresponds here to the time it takes for agents to adjust their thresholds to current market conditions, which is of order τc = 1/q. When the amplitude of the noise is small it can be shown that volatility decays exponentially in time and increases through upward “jumps”. This behavior is actually similar to that of a class of stochastic volatility models, introduced by Barndorff-Nielsen and Shephard and successfully used to describe various econometric properties of returns. I would give a kind of commonsense answer: Volatility is basically measuring the range of fluctuation of the underlying. There is always some fluctuation (noise), some average range, but there are times when people are panicking and esp. risk-averse (falling stocks, crashes, high vola) and there are times when people are esp. calm (rising stocks, low vola). Do you believe it would be otherwise? Certainly we wouldn't expect low volatility to revert upwards, so you must be asking about why volatility spikes are short-lived. Volatility spikes are often news related, either micro (merger announcement, bankruptcy notice, patent rejected, etc) or macro (rate changes, commodity bubble bursting, etc). That news isn't perpetual; the dust settles at some point and the world moves on. Related question: Why do media frenzies die down? Same answer. It is not the volatility that mean reverts, but the price! The volatility (attempts to) measure the deviations from the "equilibrium" or the "stable price" (even though we might never observe it). It is not really a cyclical behaviour of traders, but one can look at it as a continuous game of tug of war between the bulls and bears where any player can change sides at any time depending on her perception of future movements of price. Why linear interpolation not appropriate for volatility surface construction?